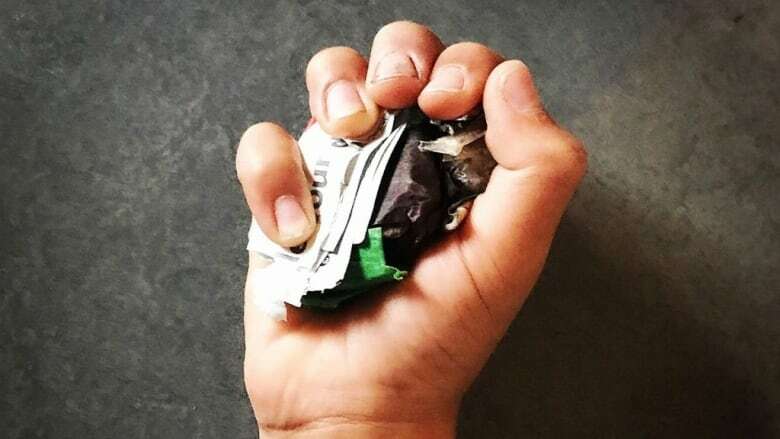 In less than one year, Tippi Thole, a web designer from Saint-Constant, has reduced the amount of garbage she and her son produce to one fistful a week. Tippi Thole makes it look easy. She and her nine-year-old son live almost waste-free, and they do it by being careful about what they bring into their home in Saint-Constant, Que. No plastic, no paper, no packaging — unless they absolutely have to. It started last New Year's Day, when Thole decided to start small to try to do her part for the environment. But within weeks, the progress was huge. "I think that's the thing I found the most surprising. I didn't think I was going to be able to make such a drastic change in such a short time. I was shocked that changing a few habits made such a big difference so quickly." Less than a year later, she and her son, Eames, produce a fraction of the trash of a typical Quebec household. And thousands of people follow their exploits on Instagram and on Facebook. Thole posts a weekly photo on her Instagram account of just how little waste her household produces. Most weeks, it can fit in a tiny jar or even in the palm of her hand. She also posts tips and suggestions on how to reduce your carbon footprint on her website, tinytrashcan.com. Thole tries to buy everything in bulk, using her own reusable containers. She doesn't rely on recycling. Her rule is to avoid accepting any plastic or paper up front. The new motto for environmentalists has been updated. It's now "Refuse, reduce, reuse, recycle and, finally, rot." "Refuse" is first because it's the most important — if you don't take home plastic, you don't have to worry about dealing with it. And rot is the final stage: compost. "I have this saying: 'Recycling is not the answer,'" Thole says. "Just because you put it in your bin, doesn't mean it will get recycled. There are a lot of contamination issues." Just a small percentage of recycling in the province actually gets recycled. "We throw about 80 per cent of the plastics we buy in the garbage. Then we put 18 per cent in the blue box, but we don't know how much of that is actually reused," says Karel Ménard of Quebec's Coalition for Ecological Waste Management. He says recycling centres may ship some of the material to China, where it may end up as garbage. "There's no way to know what happens to it." A study last year, published in the journal Science Advances, analyzed plastics around the world. It estimated that 8.3 billion metric tons of plastic had been produced by 2015. Of that, 6.3 billion tonnes have become plastic waste, and only nine per cent of that has been recycled. The rest has either ended up in landfill or as litter. "It's a matter of raising consciousness," Thole says. "I don't think people want to be wasteful.… They're just doing what they've always done. The defaults in our society are wasteful. You have to actively not be wasteful — it requires some effort. I'm encouraged by the amount of interest people have in what I'm doing." Along with shopping carefully, Thole tries to buy second-hand clothes and household items. And if her family no longer needs something, she donates it to someone who might want it. When it comes to groceries, Thole is super-organized; she plans out her purchases and does not buy anything on impulse. She has a list of what she needs, and then she prepares the empty jars and cloth bags she will need for the trip. Thole's priority is to try to buy in bulk. That's easy when it comes to everyday items, such as flour, pasta, nuts and cleaning supplies. She takes reusable jars, usually Mason jars or jars with metal clips, to a bulk store. Even certain regular grocery stores will let her use her own containers. A large Greek grocery store in Brossard lets her buy meat that way. They will weigh her jar, and then weigh it again once the sausages are placed inside. They do the same for cheese. "When they see me, they have a big smile on their face." Thole says. "It's not always easy getting pieces of meat or cheese to fit a certain container, but the store employees are helpful." In a statement, the Quebec Ministry of Agriculture, Fisheries and Food, which is responsible for food safety in the province, said stores can allow customers to fill their own containers, as long as employees follow a certain protocol to avoid cross-contamination. That protocol includes washing their hands and cleaning both the container and any surfaces it has touched. Andréanne Laurin is one of the four co-founders of a new chain of eco-friendly, bulk stores. The four met when they were students of environmental science. Their first store, Loco, was set up in Montreal's Villeray district two years ago. It did well, so last year they started a second store in Verdun. Last month, they opened a third store in the South Shore town of Brossard. Laurin says their mandate is clear: "We have no packaging. That's the first main thing. Then it's almost all organic, and directly from small producers in Quebec. We have 65 producers. That's how we reduce the footprint." There is no packaging in the stores. Instead there are bins of loose items, as well as a few things in reusable containers. There is a wall of taps, where customers can place their own containers to fill them with dish liquid, laundry soap and shampoo. The store also sells reusable straws and organic toothpaste in small mason jars. Tippi Thole says she understands not everyone can live as zero-waste as she does. For example, she and her son do not use toilet paper. Instead, they have installed a bidet attachment on their toilet. It's an old-fashioned solution to a modern problem. Thole buys wine at a refillable wine depot (Vin en Vrac) and she buys vegetables from a local farm. If she absolutely cannot find a certain item in bulk, such as chili sauce, Thole will try to buy something in a jar. That way, the jar can be reused. It is challenging, but Thole says, it is worth it. Given the recent United Nations report about climate change, Thole says it's a way to try to be positive. "If you're not doing anything about it, you can feel very helpless and powerless and it can feel defeating and depressing. But if you're actively doing something about it, it can feel so much better. "It's the opportunity of a lifetime. I try to focus on what I can control and what I can do." There is a zero-waste festival taking place in Montreal this weekend at Marché Bonsecours. Organizers are promising practical ideas to help reduce your ecological footprint.There will be workshops, exhibitions and a film screening. It's open Saturday from 9:30 a.m. to 6 p.m. and Sunday from 9:30 a.m. to 5 p.m. The film screening is Saturday at 6:30 p.m.